Time to populate your boards! 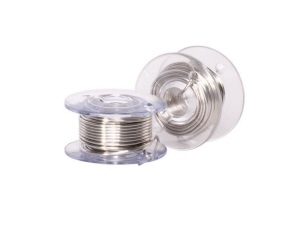 Get the solder and accessories you need to make that happen. Check product details for compatibility information. Fed up with ordering multiple stencils in between board iterations? Just snap on the RoHS Sn42/Bi57.6/Ag0.4 solder paste cartridge and the V-­One will dispense solder paste onto the pads of your board. Solder paste can be dispensed onto your V­-One printed boards, or pre­fabricated circuit boards. Each cartridge prints approximately 11,000 0603 pads. Cartridges must be kept refrigerated, and have a shelf life of 6 months. The MSDS can be found here. 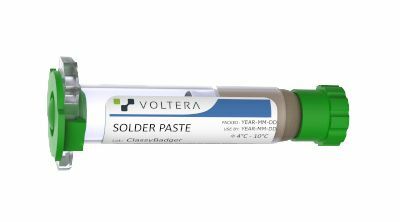 While the standard Voltera solder does work on factory-fabbed PCBs, this alloy has superior performance on boards with a lead-based HASL finish. This allows you to easily paste, assemble, and reflow your prefabbed boards. Cartridges must be kept refrigerated, and have a shelf life of 6 months. Done printing? Let’s add some components! Just be sure to use the Voltera recommended solder wire and plenty of flux to ensure a strong solder joint. We’ve chemically tested it to be most compatible with our nanoparticle ink.